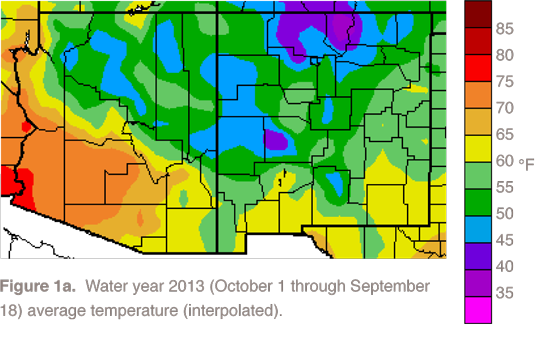 Temperatures since the water began on October 1 reflect topography; the lower deserts have been warmer than higher elevations across the Colorado Plateau (Figure 1a). The higher elevations of western northern and central New Mexico also have experienced cool temperatures. 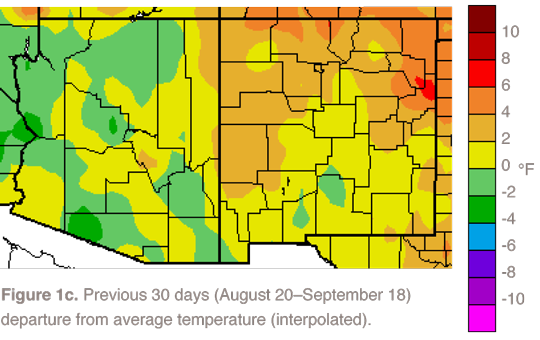 Average temperatures in most of Arizona and New Mexico have been within one degree of average, with some notable exceptions in eastern New Mexico, small areas of northern New Mexico in the Sangre de Cristo Mountains, and western Pima County in Arizona (Figure 1b). During the last winter, cold winter storms passed more frequently through northern portions of both states than southern regions, helping drive down average conditions. The past few months as a whole were above average, with weather stations at the airports in Tucson, Phoenix, Flagstaff, El Paso, and Albuquerque all recording temperatures within their warmest five summers on record. The June–August period was also the seventh and 12th warmest on record for New Mexico and Arizona, respectively. In the past 30 days, temperatures in northern New Mexico were mostly between 2 and 6 degrees F warmer than average. In southern regions, although temperatures were above average, their deviations were less than they were in regions to the north (Figures 1c–d). The north-south temperature gradient likely would have been greater had it not been for recent rainfall from the subtropical moisture that moved up into Colorado in mid-September and cooled many parts of the higher elevations. 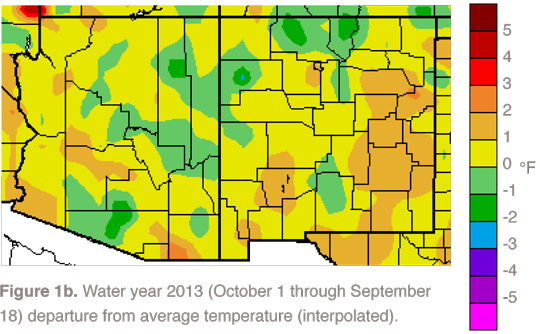 In Arizona, temperatures were both above and below average, with cooler temperatures in regions with more rainfall. The water year begins on October 1 and ends on September 30 of the following year. We are in the 2013 water year as of October 1, 2012. Water year is more commonly used in association with precipitation; water year temperature can be used to measure the temperatures associated with the hydrological activity during the water year. Average refers to the arithmetic mean of annual data from 1981–2010. Departure from average temperature is calculated by subtracting current data from the average. The result can be positive or negative. The continuous color maps (Figures 1a, 1b, 1c) are derived by taking measurements at individual meteorological stations and mathematically interpolating (estimating) values between known data points. The dots in Figure 1d show data values for individual stations. Interpolation procedures can cause aberrant values in data-sparse regions. These are experimental products from the High Plains Regional Climate Center.